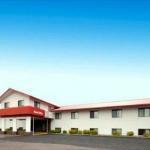 Free Wi-Fi free breakfast and value-friendly rates attract budget-minded our guests to the Rodeway Inn Mitchell. The two-story Rodeway Inn houses 44 rooms (many are non-smoking) featuring free Wi-Fi premium cable TV and coffeemakers. Rooms with microwaves and refrigerators are available. Start your day at the complimentary continental breakfast served in the lobby. For your convenience the hotel provides a coin laundry and parking. Pets are welcome for an additional fee. The Rodeway Inn is a half-mile from Dakota Wesleyan University and one mile from the Dakota Discovery Museum and the Pioneer Museum. The Corn Palace is two miles away as are Lake Mitchell and the Prehistoric Indian Village. The hotel is six miles from Mitchell Municipal Airport and 65 miles from Sioux Falls Regional Airport.